1. You constantly have to explain the difference between a trumpet and the man who repeatedly shouts “Brass! Brass!”: No, they’re not the same thing, okay? 2. There was always one kid who’d mess up formations and accidentally lead the marching band into a car compactor: Then the director would punish EVERYONE for one idiot’s mistake. Ugh. 3. The brass section rode on the roof of the bus and shouted, and the woodwinds rode in the undercarriage and hummed: You gotta know where to sit on the road to a regional competition. 4. There was nothing better than playing a saxophone pulled freshly from the freezer: A chilled sax. So refreshing, especially on a hot day. 5. You can still perfectly remember what a trumpet is: It’s the tan one. 6. The timpani contained the curled-up skeletons of their former players: This time-honored band geek tradition goes back centuries. 7. Performing the JAG theme song for David James Elliot was kind of a letdown: After all that buildup, it was just another concert, even if Captain Harmon Rabb Jr. himself was in attendance. 8. Being the baton was the highest honor: Yep. 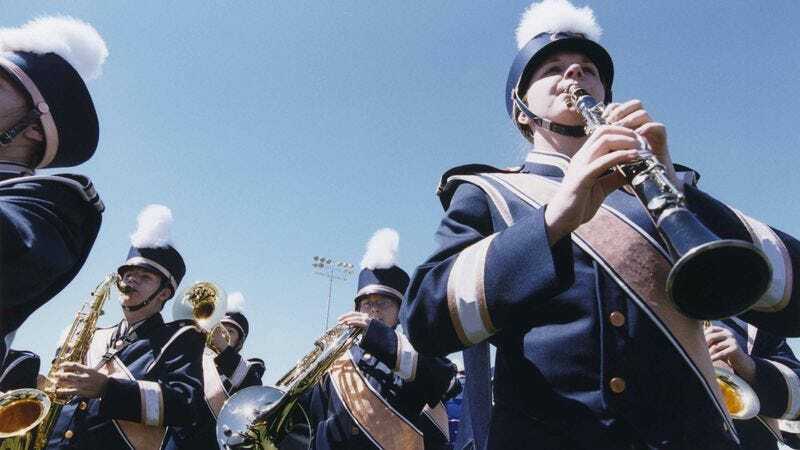 It’s all any band geek ever wanted: the coveted responsibility of being the baton, even for just a day.